So, you have enrolled your dog into a 4 or 5 week board and train. 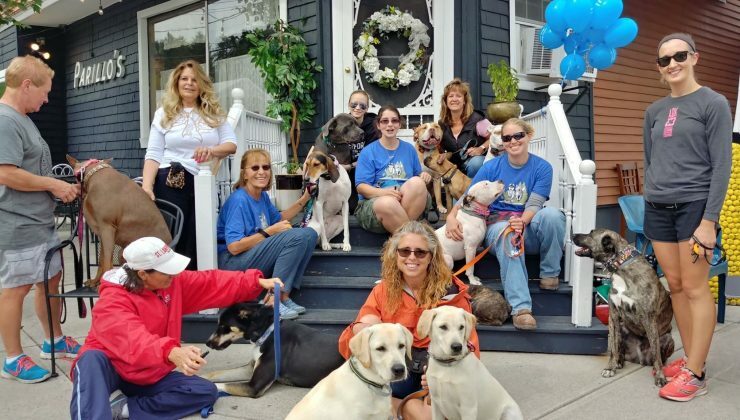 The first step you went through to enroll was to have an interview with Run By Dogs trainers to see if we are a good fit for you, and for us to see if you are a good fit for us. During the interview we give you a sample Exit Plan which details out what 90 days of you and your dogs life looks like after the dog goes back home. We label each command we taught the dog, and the direct definition of each command. We provide a sample of what corrections and praise will look like, when free time to the dog can be given, and a list of commands to preform each day. Essentially, it’s a timeline of how we created a trained dog, with a good relationship with us. We know the dog is ready to exit the training when the dog can preform all expected commands, and has a natural flow of “dog “ behaviors. Meaning, less anxiety attacks, higher confidence, follow through when the dog makes mistakes, decreased aggression, more problem solving techniques and a happy attitude. BUT, here’s the thing…trainers work hours each day for weeks to attain this. We expect the owner to take the dog home and put in the same efforts. During the board and train interview we show the dog owners each tool we will use on the dog, and test the tool on the humans. Then, if we are a good fit, we schedule for training. The first 10 days is an adjustment period for your dog. The first few days we just want the dog to get into the groove of their new lifestyle. Dogs very typically slow down on their food and bathroom. It is hard being in a new environment, and dogs who are in a board and train usually have behavorial issues paired up with their training. So, already the dog is at a disadvantage of dealing with stress, newness, smells, people, etc. After about 5 days the dogs typically become accustomed and relax. Then we start working on basic obedience commands, and accountability. By the end of 10 days to two weeks, dogs are happy in their work and have adjusted to their lifestyle. Their eating increases, their bathroom habits become normal, and they are ready to start state of mind work. It’s not uncommon for dogs to lose weight while they adjust. Also, we have started dogs on treadmill training and walks. Many of the dogs that come to us walk a combined 5-8 miles, 6 days a week. Imagine yourself going from your current lifestyle to being a physical athlete 6 days a week, and cognitive work 4 hours a day 6 days a week. Imagine how different your physical body would be, and your state of mind with all the serotonin (the feel good hormone) releasing. We have a live feed videos for the owner to watch, so they can see how their dog looks, mentally as well as physically. We like live feed videos, as the training is so transparent- what you see if what you get! At two weeks, we have the dog owners come in for a Check In. Owners do about 10% of the handling at the first check in , and the trainers do about 90 % of the rest. Why? Because it’s the first step to creating the relationship you need with your dog to be successful. When the dog is calm, making good choices in front of their family, and in a good state of mind, we hand over the leash. Think: What you pet, is what you get. So, if the trainers hand over a dog who is reactive about seeing their family come through the door, the owners will once again have a reactive dog (or fill in the behavior you initially brought in for training, ie jumping, whining, etc.) During this check in we give owners homework. Watch training videos and reading information. This is imperative to the owners success, as this homework will help you out with philosophy, methods, timing, commands, and tools. We do another Check In at weeks 3, 4 and then the Exit Day. So, you will constantly be able to see your dog either on live videos, social media photos, and check ins. We don’t like any surprises for you guys! Also, the check in give you hours of hands on training, so you know exactly what to do, and what the dog is capable of when you take them back home. At the Exit Day, the owners handle the dog about 90% of the time, we go over all commands, your individual Exit Plan for 90 days and schedule your follow up training. There you have it! For more info on board and trains, you can also read our FAQs on our website. Everyone loves the idea of dog parks, dog daycares, of socializing their dog with the friendly dog on the trail. Because every dog training or dog behavior article we read says we must socialize our dogs as much as possible. Meet Sadie – who just might be a living legend in New York's Capital District and beyond. She is a recently retired therapy dog, who (like many people) struggles with accepting retirement.